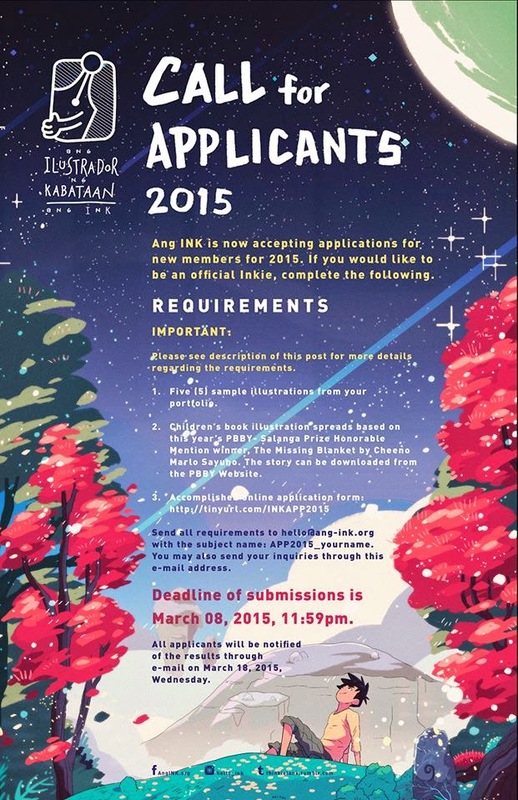 Ang Ilustrador ng Kabatan (Ang INK) is now accepting applications for new members for 2015. DEADLINE: March 8, 2015, 11:59 PM. Individual images should at least be 1000px on one side, 72 dpi, JPG or PNG. Compile all 5 of your works in 1 PDF. File should not exceed 7mb. PDF name should follow the format: INKAPP15-yourname-PORTFOLIO. All entries must consist of three (3) illustrations that are of the same size and medium. Entries do not have to be based on consecutive spreads/parts of the text. You are not required to layout/include the text in your illustrations. Individual images should be 9”(h) x 14”(w), and should not be more than 72dpi, jpg or png. Compile ALL 3 images in ONE pdf. Total file size of the pdf should NOT exceed 5mb. PDF name should follow the format: INKAPP15-yourname-PBBY. Send all requirements to hello@ang-ink.org with the subject line APP2015_yourname. (4) Membership fee for accepted members: P1,300 for professionals, P950 for students.